If any of you read popular fiction, have been to a movie theater recently, or even followed posts on popular media, the trend now a days is to be a hero. From firefighters, and policemen (who are real-life heroes), to the multitude of Super Hero characters, such as Ironman, The Hulk, or Batman. There seems to be a need for heroes in our lives. We want someone to protect us, to fight off bad guys, to fight the good fight. Anyone who has served in the military, especially if they have gone in to combat in defense of their country, truly knows what it means to be a hero. Can you imagine going into the middle of a war zone? Bullets whizzing by over your head. Rockets, grenades, shells, land mines going off all around you? It would be frightening, wouldn’t it? What if you went back in time? Can you imagine being in the middle of a field of knights on horseback and foot soldiers, wildly swinging huge swords, maces, and battle axes, as arrows whizzed by over your head? I don’t think any of us would really want to be down in the middle of that. But think about this: is it even conceivable to imagine that you, if you knew you were headed into that kind of war zone, that you would do so with the clothes you have on right now? Take a look at what you’re wearing. How do you think those clothes would fare in the middle of battle like the ones I just described? Any good soldier, or hero knows you must prepare to do battle, and this includes putting on armor, equipping ourselves for the upcoming battle. Did you know that there is an unseen battle that you and I are engaged in every single day; a conflict, a fight for your heart and your mind? 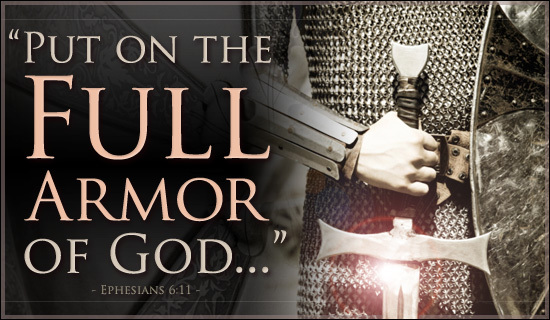 Ephesians 6:10-20 is perhaps the clearest definition of the spiritual war. the Apostle Paul has several things he wants us to understand, several things God wants us to understand about the unseen battle that is raging all around us; the battle, if we belong to Jesus through faith, the battle we are always fighting. In this spiritual war, we are “A Band of Brothers.” We fight side by side. We watch each other’s backs. We protect each other and defend each other. We go to the wall for each other. We march with each other. This is key for us to understand, and especially for us to practice. When you see another brother or sister in Christ who is facing problems, you need to come along side them and help them. See what you can do to serve and support them. In a battle, the heroic soldiers are those who stay and help the wounded get off the battlefield. Those who flee just to protect themselves are seen as cowards. As Christians, we are in this battle together, which means we must help those around us who get injured and damaged in the fight. We must come around them and give them the encouragement and support that they need. That is good to know in a war like this. It is good to know that we are not fighting alone. It is good to know that we have friends and allies. It is good to know that we are watching out for one another. That is what Paul means here by using those encouraging words…….we are never alone! If we are going to survive spiritual warfare, we must constantly be in training for battle so that we can become stronger. However, when we do these things, we need to remember that we ourselves are not getting stronger, nor is it our strength by which we are doing these things. Notice that the strength comes from the Lord and in the power of His might. This strength comes to us from God as we exercise and train and discipline ourselves. As we engage in the spiritual disciplines of Bible reading, praying, attending church, tithing, evangelism, etc., we naturally grow stronger in the Lord and His might is able to work in and through us more easily.